Service and Repair | Bouma Bros. Sales and Service Inc.
Late last night, Luke’s son mistakenly put the car in the forward position instead of reverse and ran right into his dad’s door. This morning when Luke woke up to a hole in his door, he was pleased to know we were there to help! In situations like these, our technicians will replace the door and make sure the operation system works just like it did before. At Bouma Bros. Sales and Service Inc., we deal with a lot of garage door issues, whether it’s a residential, commercial, industrial, or agricultural matter in the Grand Rapids area. Over the years, our specialists have acquired skills and knowledge that will assure a high standards customer service and garage door repair. No matter what the problem may be, whether your garage door is making strange noises, one of the cables is damaged, or you have had an accident like the one Luke’s son had, we have a solution for you. And thanks to our fully-equipped service vehicles and professional repairmen, the work can be completed rapidly and efficiently. If you notice that one of your garage door pieces is broken or damaged, contact us and we will come and replace it. Our experienced technicians can carry out most garage door repairs on‑the‑spot, as their service trucks are stocked with a full supply of tools and parts. They are proud of their work and are able to repair any brand of garage door there is on the market with ease. If you need our service for any broken parts, you can contact us online to schedule an appointment. This issue is very common. Squeaking can be a result of damaged sections, dysfunctional door cables, worn out pieces or bent or misaligned tracks. It usually means that your door needs its regular maintenance and some lubrication on any worn out parts. Our technicians from the Wyoming, MI region will gladly do that for you, making sure your door operates properly and quietly. At Bouma Bros. Sales and Service Inc., we fix all garage door opener brands! If over the years, you run into a minor problem with a garage door opener, it is likely that it's because of a misalignment, an obstruction of the photo-electric sensor system or because the radio transmitter has low batteries. Be assured that our expert technicians recognize these situations easily. Call Bouma Bros. Sales and Service Inc. for all your garage door opener needs in Wyoming, MI. Our dedicated team of employees will come quickly to your home to check out your garage door system, identify the cause of any problems and offer an efficient solution. 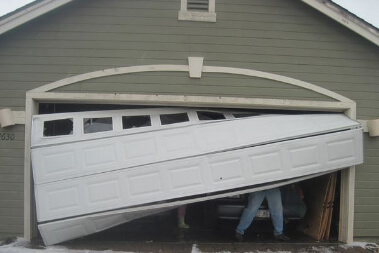 To avoid accidents and guarantee a safe use every time, we recommend you not attempt to repair your own garage door. The experts at Bouma Bros. Sales and Service Inc. will come out to your home to do a complete inspection of your garage door system. You can trust us entirely, we are known for our expertise and knowledge in this field. We also offer an annual preventive maintenance program for your garage door and the added peace of mind that comes along with it. This program includes a ten-point inspection plan on all important pieces of your door. Contact us now at: 616-452-4704!